NOTE: This product was purchased at Target. Purpose: "... strengthen and soften the hair, ... smooth the cuticle for straight, strong tresses, adding a brilliant glow and luminescent shine ..."
Ingredients: Water (Aqua), Behentrimonium Chloride, Cetyl Alcohol, Glycol Stearate, Glycerin, Dimethicone, Cetearyl Alcohol, Ceteareth-20, Parfum, Hydrolyzed Keratin (Protein), Theobroma Cacao (Cocoa Butter) Extract, Cocos Nucifera (Coconut) Oil, Persea Gratissima (Avocado) Oil, Aloe Barbadensis (Aloe Leaf) Extract, Panthenol, Tetrasodium EDTA, DMDM Hydantoin, Methylchloroisothiazolinone, Methylisothiazolinone, Blue 1, Red 40, Yellow 5. Applied to freshly washed hair. Waited for 3-5 minutes (as instructed). Organix products are usually a miss for me, but this one has actually been a hit. To me, it is comparable to Aphogee 2-Minute Keratin Reconstructor in effectiveness. It leaves my hair just as moisturized and strengthened. The smell is also very pleasant, like a toned down cocoa butter scent. I really like to use this product prior to flat ironing because the end result is well-conditioned, super smooth, shiny hair. This conditioner has the potential to become a regular one in my stash, though Aphogee 2-Minute is still my numero uno. 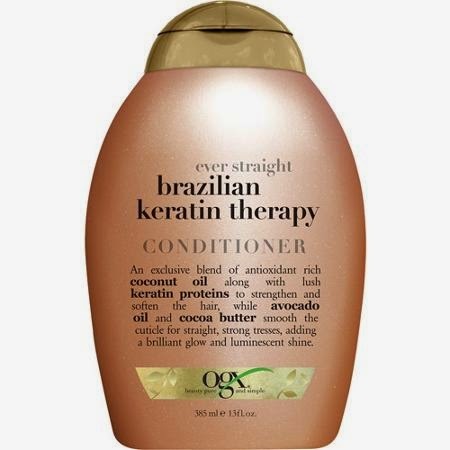 RATING: Overall, I give the OGX (Formerly Organix) Brazilian Keratin Therapy Conditioner 5 out of 5 stars. Thanks for this review. I will try it. I also loved this line from OGX! I also loved the Keratin Oil conditioner as well! I usually don't like this product line but had to buy some in a pinch and I fully endorse the keratin lines!